Pony catching. Most of the ponies out in the Forest are untamed, and not used to being handled, so it can be tricky to catch them if they need to be brought in. Some old commoners had special ways of catching ponies. They would hide a ‘ring rope’, or noose, in a narrow path between bushes, and then carefully stalk the pony to persuade it to go down the path and catch itself in the rope. 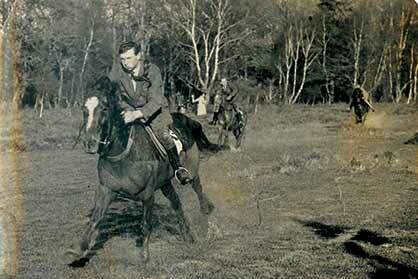 ‘Colt hunting’ is another way of catching ponies, by following them on horseback and getting hold of them. It takes a lot of nerve and skill! Point-to-point just means a horse race in most parts of the country, but the New Forest is one of the few places that has a ‘proper’ point-to-point, where riders race across open country taking any route they like between the starting point and the finishing point. To make the job harder, the starting point is kept a secret until just before the race. The competitors turn up at a meeting place where they are weighed-in (the race is a handicap), then the starter leads them off through the Forest to the actual starting point. Some riders might have no idea where they are when the race begins, and the competitors can set-off in different directions. The races are usually held on Boxing Day. Today the organisers of the race are very concerned about the safety of the horses, riders and spectators. But not so long ago the riders didn’t even bother to wear hard hats. Pannage is the common right to turn pigs out (the word pannage means the food that pigs can find on the ground in a forest, especially acorns and other fruit dropping from trees). 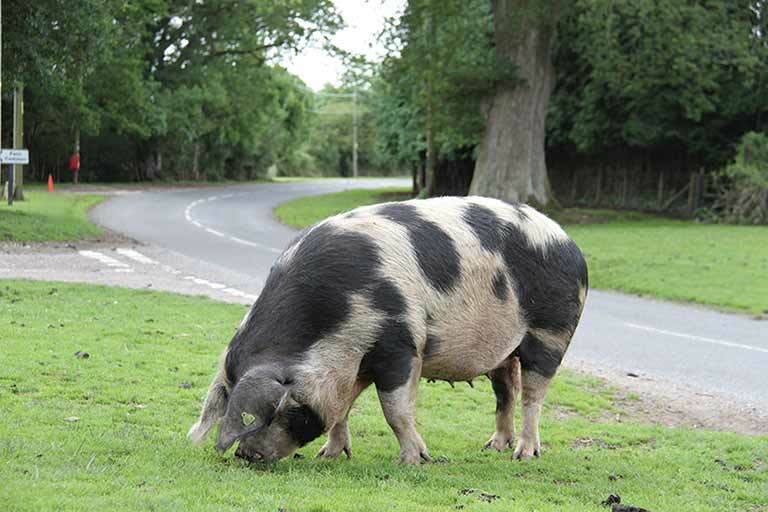 The ‘pannage season’ is the time of year when pigs are allowed to live out in the Forest. The job of the pigs is to eat the acorns, which are poisonous to the other animals. The dates of the pannage season are set by the Verderers (see V). Usually the pannage season runs from September to December, but the season can be extended if there’s a particularly heavy acorn crop.